Click to listen to episode (3:52). Unless otherwise noted, all Web addresses mentioned were functional as of 1-18-19. From the Cumberland Gap to the Atlantic Ocean, this is Virginia Water Radio for the week of January 21, 2019. The week we revisit a January 2012 episode about a bird known as a symbol of coastal areas. Have a listen for about 10 seconds to the following mystery sounds, and see if you can guess what’s making the clucking, croaking, and squeaking. And here’s a hint: You might find this throaty creature in a dive. If you guessed pelican chicks, you’re right! Out of seven or eight pelican species worldwide, two occur in North America, and both are known from Virginia’s coast, at least occasionally. The American White Pelican is considered an uncommon visitor in Virginia. The Brown Pelican, on the other hand, is found year-round in the Commonwealth and has been occurring in increasing numbers in Virginia coastal waters since the 1980s. Brown Pelicans were listed as a federally endangered species in 1970, after their populations had significantly decreased over several decades. 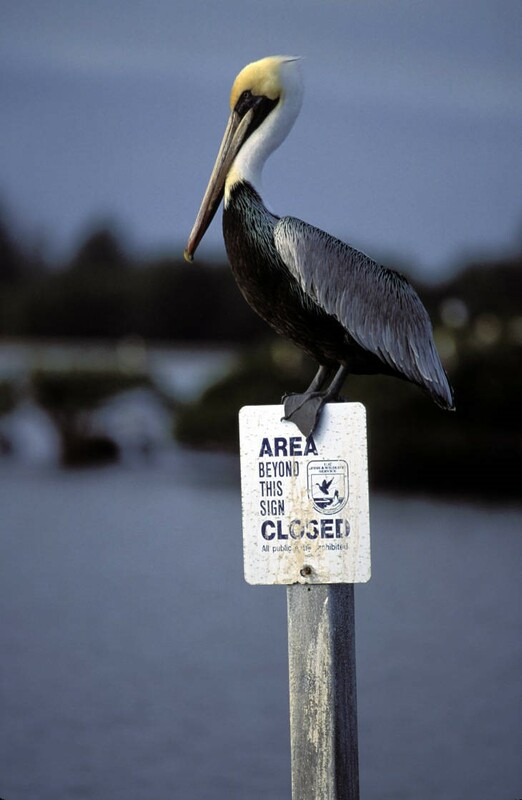 In fact, protection of Brown Pelicans was a significant reason for establishment in 1903 of the first U.S. National Wildlife Refuge on Florida’s Pelican Island. A 1972 ban on the pesticide DDT, habitat restoration, and other conservation efforts have helped Brown Pelicans make a remarkable recovery. The species’ populations from Alabama northward along the Gulf and Atlantic coasts were removed from the federally endangered list in1985, and other populations were removed from the list in 2009. Pelicans are fish eaters, and Brown Pelicans are known for their feeding behavior of plunging from flight into water to trap fish in their large, expandable throat pouch. Surfacing after an underwater catch, the birds point their bill down to drain out large amounts of water, then raise the bill up to swallow the fish. Some other Brown Pelican peculiarities include being largely silent as adults; having excellent eyesight to spot fish from high above; suffering from seagulls that will try to take fish from a pelican’s pouch; and standing over their eggs to incubate them with heat from the skin of the adult pelican’s feet. With their fortunes much improved since the first days of Florida’s Pelican Island Refuge in the early 1900s, Brown Pelicans are now a familiar flying and fishing feature along many coastlines, including Virginia’s. Thanks to the U.S. Fish and Wildlife Service for making the pelican chicks sounds available for public use. This Virginia Water Radio episode revises and replaces Episode 95, 1-16-12, and the “Water Sounds and Music” segment of Episode 37, 10-11-10. The sounds of pelican chicks were taken from the U.S. Fish and Wildlife Service “Video Productions and Broadcasts,” online at http://www.fws.gov/video/sound.htm, accessed 1/18/19. For more Fish and Wildlife Service sounds, as well as video and images, see the National Digital Library, online at http://digitalmedia.fws.gov/cdm/. Brown Pelican painting (top) and American White Pelican painting (bottom), originally published between 1827 and 1838 by John James Audubon, as reprinted in 1985 by Abbeville Press, New York. Information about Birds of America is available from the National Audubon Society, online at http://www.audubon.org/birds-of-america; the Brown Pelican entry is online at https://www.audubon.org/birds-of-america/brown-pelican-0. Photos taken in 2019 from the reprint copy (no. 6 of 350 copies printed in 1985) owned by Special Collections of Virginia Tech Libraries. Virginia Water Radio thanks Special Collections for permission to photograph their copy and for their assistance. Brown Pelican at Pelican Island National Wildlife Refuge in Florida. Photo by John and Karen Hollingsworth, made available for public use by the U.S. Fish and Wildlife Service's National Digital Library, online at http://digitalmedia.fws.gov, accessed 1-21-19. The specific link to the photo is https://digitalmedia.fws.gov/digital/collection/natdiglib/id/1628/rec/2. Young Brown Pelican on nest in Breton National Wildlife Refuge in Louisiana. Photo by Donna A. Dewhurst, made available for public use by the U.S. Fish and Wildlife Service's National Digital Library, online at http://digitalmedia.fws.gov, accessed 1-21-19. The specific link to the photo is https://digitalmedia.fws.gov/digital/collection/natdiglib/id/3400/rec/13. The scientific name of the Brown Pelican is Pelecanus occidentalis. 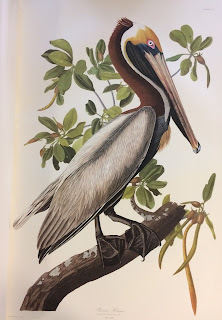 Audubon Guide to North American Birds, “American White Pelican,” online at https://www.audubon.org/field-guide/bird/american-white-pelican; and “Brown Pelican,” online at https://www.audubon.org/field-guide/bird/brown-pelican. Chesapeake Bay Program, “Brown Pelican,” online at https://www.chesapeakebay.net/discover/field-guide/entry/brown_pelican. Cornell University Lab of Ornithology, “All About Birds,” online at http://www.allaboutbirds.org. The American White Pelican entry is at https://www.allaboutbirds.org/guide/American_White_Pelican/; the Brown Pelican entry is at https://www.allaboutbirds.org/guide/Brown_Pelican/. Encyclopedia Britannica, “Pelican,” as of 1/3/19, online at https://www.britannica.com/animal/pelican. U.S. Fish and Wildlife Service, Brown pelican populations recovered, removed from Endangered Species List, 11/11/09 news release. U.S. 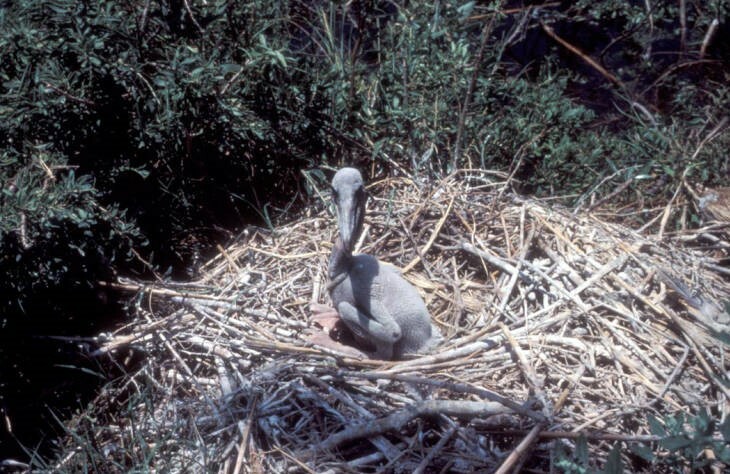 Fish and Wildlife Service/Breton National Wildlife Refuge (Louisiana), “Brown Pelican,” online at https://www.fws.gov/refuge/Breton/wildlife_and_habitat/pelican.html. U.S. Fish and Wildlife Service/Pelican Island National Wildlife Refuge (Florida), online at https://www.fws.gov/refuge/Pelican_Island/about.html. Virginia Department of Game and Inland Fisheries, “Fish and Wildlife Information Service,” online at http://vafwis.org/fwis/?Title=VaFWIS+Species+Information+By+Name&vUT=Visitor. The American White Pelican entry is online at https://vafwis.dgif.virginia.gov/fwis/booklet.html?&bova=040019&Menu=_.Taxonomy&version=17914. The Brown Pelican entry is online at https://vafwis.dgif.virginia.gov/fwis/booklet.html?&bova=040020&Menu=_.Taxonomy&version=17914. 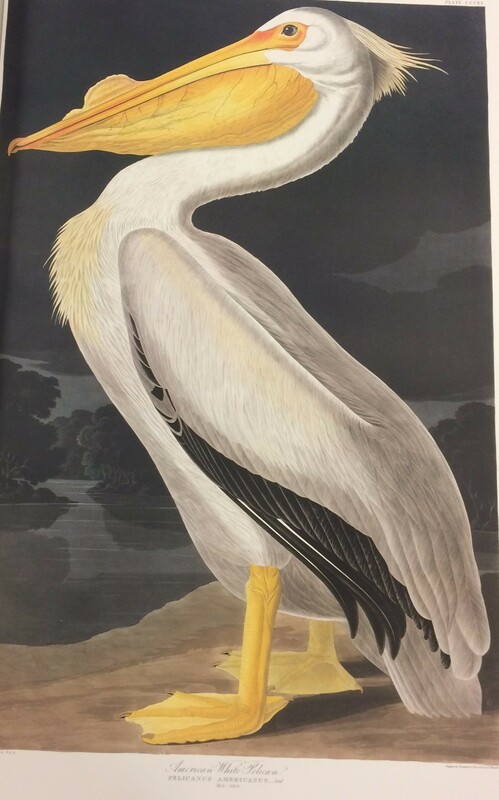 John James Audubon, “American White Pelican—Plate 311,” from Birds of America, accessed from The Audubon Society, online at https://www.audubon.org/birds-of-america/american-white-pelican. John James Audubon, “Brown Pelican—Plate 251,” from Birds of America, accessed from The Audubon Society, online at https://www.audubon.org/birds-of-america/brown-pelican-0. Following are links to three other episodes that mention pelicans. Episode 183, 10-14-13, on fall migratory birds. Episode 206, 3-24-14, on sounds of spring. Episode 282, 9-21-15, on living things vs. non-living things (for kindergarten students).